With one of the biggest collections of slot machines online Videoslots casino offers you the chance to try out a top game and then gives you a whole load of bonus money to try out even more. We’re going to start with saying you’ll see the Videoslots bonuses throughout this bonus review in € but you can replace that with your equivalent currency whether its GBP, CAD, SEK, NOK or more. With over 2,600 online casino games and over 1,000 on mobile Videoslots casino provides plenty of entertainment value, as they also host a whole load of daily slot tournaments, weekly casino races and Weekend Boosters every Friday. So if you’ve never heard of them before now’s the time to try them out and get your welcome bonus. A little taster to the site here you get 11 welcome spins to play on one of NetEnt’s most popular slot games, Starburst. Or if you’re from Canada where you can’t play NetEnt games you’ll have 11 welcome spins waiting for you on the Rook’s Revenge slot by Betsoft on your first deposit. Starburst however, is a jewel of a game with expanding wild reels providing respins and the potential for some big wins as you spin on this explosive slot. All you have to do to claim your welcome spins is to sign up, which is totally free and make your first deposit of €10 or more, simple to do. You’ll have to give a few details when creating your Videoslots casino account and of course make that all important first deposit and then you can instantly start playing by opening up the Starburst slot online or on mobile. With 11 bonus spins you might not win much, but you’ll get the chance to play casino for free with wager-free winnings and see if this is the next site for you. So you’ve had a look around, played your free games and now it’s time to use that all important deposit. With local currencies like GBP, EUR, CAD, NOK, SEK and USD you’ll be able to hopefully not have to do any calculations in order to meet the minimum deposit of £€$10. 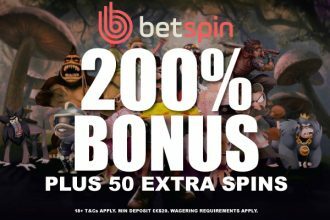 But with a 100% deposit bonus up to €$200 to make the most out of this you’ll want to deposit £€$200 to receive £€$200 and play with a total of £€$400. Just remember to gamble responsibly and only deposit what you can afford, cause at the end of the day any extra cash is literally a bonus. As little as £€$10 will give you another 10 and a total of €$20 to play with, perhaps not as big a first deposit as you’ll find at Thrills giving you 200% up to €$100 meaning you can play for less, but still well worth it. A few things to note, you will have to wager your deposit 20x in order to clear the Videoslots bonus wagering requirements and the return to player rate of the slots you play has a direct influence of the wagering percentage. Our advice, stick to slots with 96% RTP or lower in order to meet the wagering quicker. Of course we did. 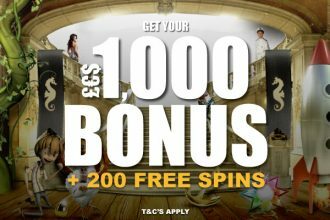 Cause Videoslots online casino like to do things a little differently: not only do they give you welcome spins and a 100% deposit bonus, but they will also reward you with £€$10 extra cash when you make your first deposit too. And who can turn down a little extra cash? According to their terms and conditions, you will have to wager £€$200 worth of bets before you get the £€$10 accredited to your account but that should be easy enough given the amount of bonus money you can get on your first deposit and their long list of games from over 55 software providers. We’ve already mentioned some regarding the wagering requirements of the deposit bonus, that of 20x your deposit plus that the return to player rate of the game affects the wagering percentage. But there are a few other things to look out for here. There’s nothing that unusual here for a casino welcome bonus. The fact that you have to be a little clever about which games you clear the 100% bonus wagering on will give you a chance to go through their huge slots collection. And at the end of the day if you see any bonus as a way to prolong your slots experience and get even more entertainment for less then you’ll always come out on top. Yes winning would be great too, but see a casino bonus as a way to try out new games you usually wouldn’t and then when you’ve found a few new favourites you’ll have a great internet casino to play at. 11 welcome spins – You will receive 11 welcome spins in a random game upon first deposit. You have 7 days to activate the bonus, once activated free spins must be used within 24 hours. Deposit required to play. All winnings from free spins are wager-free. You can withdraw a maximum of £10 from your winnings. 100% deposit bonus up to £200 – We will match your deposit up to £200 on your first deposit. £10 minimum deposit required. You are required to wager the bonus amount 20 times before you can withdraw the bonus funds. You can forfeit the bonus and take the winnings and paid out bonus funds. Only the remaining balance of the bonus which has not yet been released will be forfeited. Bonus will be paid out in 10% increments to your cash account. Jackpot games do not contribute to the conversion. Maximum bet per spin is either 50% of your deposit up to £20. You must be 18 or over to play and 21 in countries where that is the minimum age by law. Play Responsibly. There are over 2,600 reasons to start playing at Videoslots casino on mobile or online. That 100% deposit bonus up to €£$200 will give you even more to experience all that this site has to offer. With weekly casino races where you can win a share of £€$90,000 with no wagering on your winnings, daily slot tournaments in their Battle of Slots lobby that provide you with buy-in and freerolls and some of the biggest jackpot games around you’ll never get bored. Plus with Weekend Boosters giving you money back on your weekly wagers this is one online casino that knows how to keep players happy. To find out more you can read our Videoslots casino review or head straight there and start spinning.